Christian IV was the king that made his mark on history, because many of the palaces and other structures he built are still standing today. In his 60 years on the Danish throne, he governed a kingdom that had never before and has never since been so big. Denmark comprised the whole of Norway, Schleswig-Holstein, Scania, Halland and Blekinge as well as what we know today as Denmark. It also included the distant colonies of Greenland, Iceland, the Faroe Islands and Tranquebar. Christian IV ascended to the throne at the age of 19. Christian spent the first years of his reign travelling the world by sea. He was inspired by the magnificent castles he saw in England and Italy. As soon as he returned to Denmark, he set to work on commissioning the construction of magnificent buildings. The figure 4 began to appear throughout the city of Copenhagen and elsewhere. The Royal Exchange (Børsen), the Round Tower, Trinitatis Church and Rosenborg Palace all bear the king’s monogram. He also added a spire to the main tower of Copenhagen Castle, the Blue Tower. What he did not know was that his own daughter Leonora Christina would be incarcerated in this very same tower after his death. He also built a brand new Frederiksborg Palace where he unashamedly likened himself to the heroes of antiquity. He decorated his palace with busts of Caesar and Alexander the Great, as well as columns and triumphal arches. In the castle square, he erected a statue of Neptune holding sway over the Sound. People thought highly of the king, and the king thought highly of himself. It was not just fine buildings that Christian IV was interested in. He was also fond of beautiful women. He married twice and had numerous mistresses. The fruit of the king’s nocturnal escapades were 24 children with five different women. He spawned 12 of these children with his morganatic wife, Kirsten Munk, with whom he fell head over heels in love. In 1608-1616, the king began construction of a bastion on Frederiksholm’s canal to protect the capital from enemy attacks. Soon after work on the bastion was completed, Christian began construction of a chain of fortification and defensive works known as Christianshavn’s ramparts. This was a much stronger defensive construction against enemy canon fire. The bastion now became redundant. The king therefore decided to convert the bastion into a brewery to quench the thirst of his many soldiers. On 24th September 1629, a fire broke out at Kronborg Castle. Kirsten Munk was in childbirth with the couple’s infant daughter Dorothea Elisabeth. Kirsten Munk and the newborn child were rescued at the last moment, just before the interior of the castle was engulfed in flames. 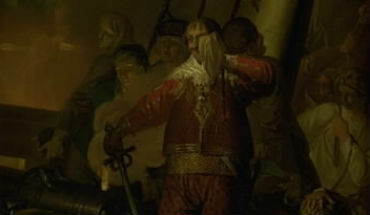 Christian IV was determined to preserve his father's beloved Kronborg, but the royal coffers were empty, and the National Council were adamant that they could not afford to rebuild the castle. However, the king decided to double the Sound Dues, and in 1638 the Kronborg Castle was rebuilt and modernised. The king’s dreams of grandeur grew, and his interest in erecting fine buildings did not diminish either. One day, no longer content just with being the most powerful king in Scandinavia, he decided that he would reign supreme over Protestant Europe. The Thirty Years War was raging and the Catholics and Protestants were fighting a bloody war. Christian IV became the Protestants’ military commander. However, his allies let him down in a decisive battle and he was forced to flee. Matters took a turn for the worse when the German Kaiser demanded a huge sum of money from Christian, Kirsten Munk cheated on him, and he had to mortgage his crown. In a battle with the Swedes at Kolberger Heide, a cannon ball hit the king’s ship, The Trinity (Trefoldigheden). The canon exploded, the king lost his eye and the war, but won the esteem of his people for his courage. Once again, the king had to cede territory, his royal wings had been clipped and he had to abide by the will of the National Council. Christian IV died at Rosenborg Palace in 1648 aged 72, with his favourite daughter Leonora Christina by his side.